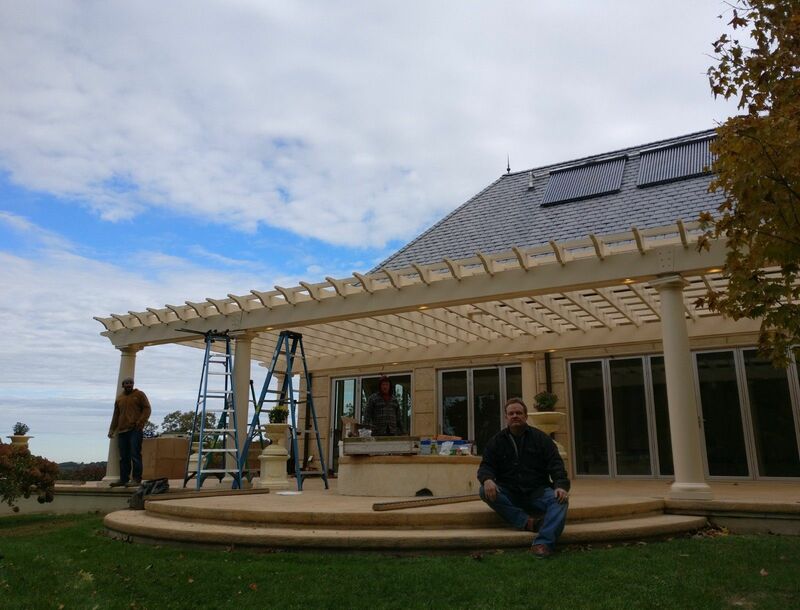 Use our quick & easy pergola builder and get a free quote today. 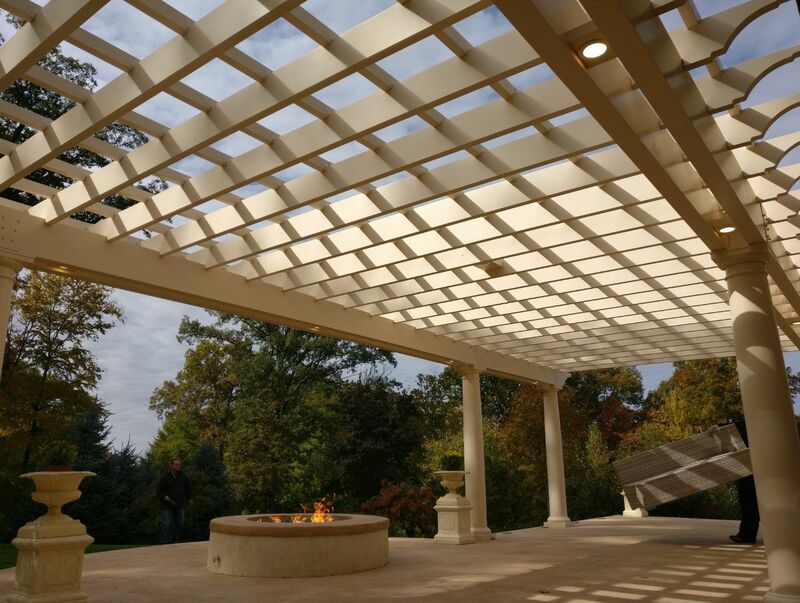 Baldwin Pergolas is the industry leader in the design and manufacture of custom fiberglass pergolas. We offer the ZERO maintenance option for your backyard or patio. 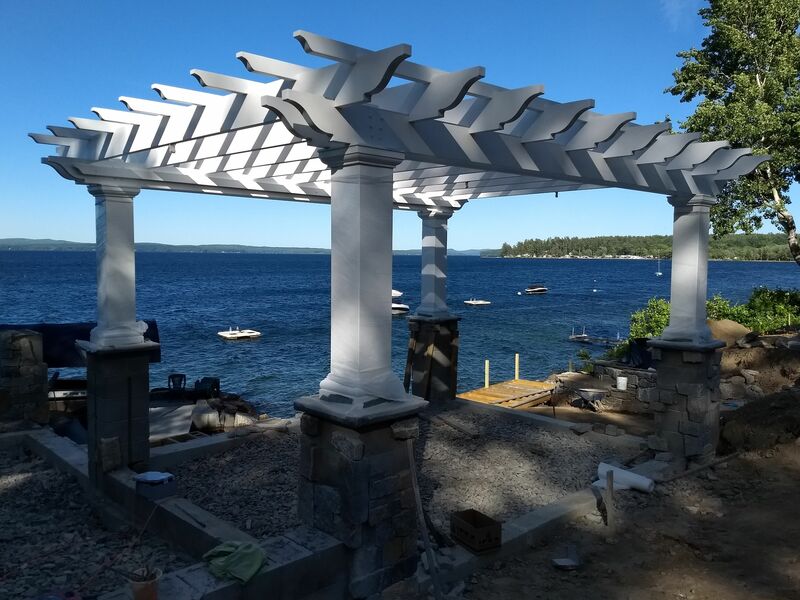 Through the use of structural fiberglass members and columns and tough PPG industrial coatings our will last a lifetime. At Baldwin nothing is left to chance, our experienced and design and manufacturing teams ensure that every detail is considered. 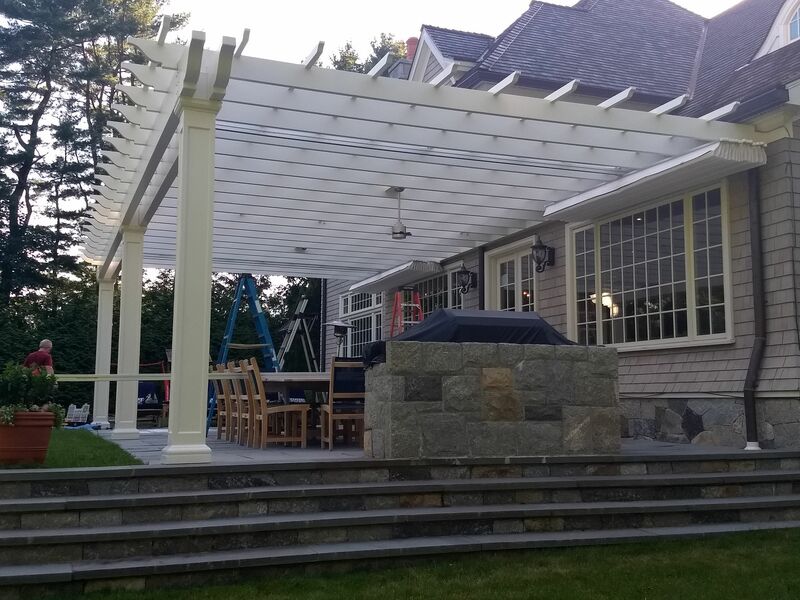 We use only the highest quality American made materials and work tirelessly to ensure our client's satisfaction. 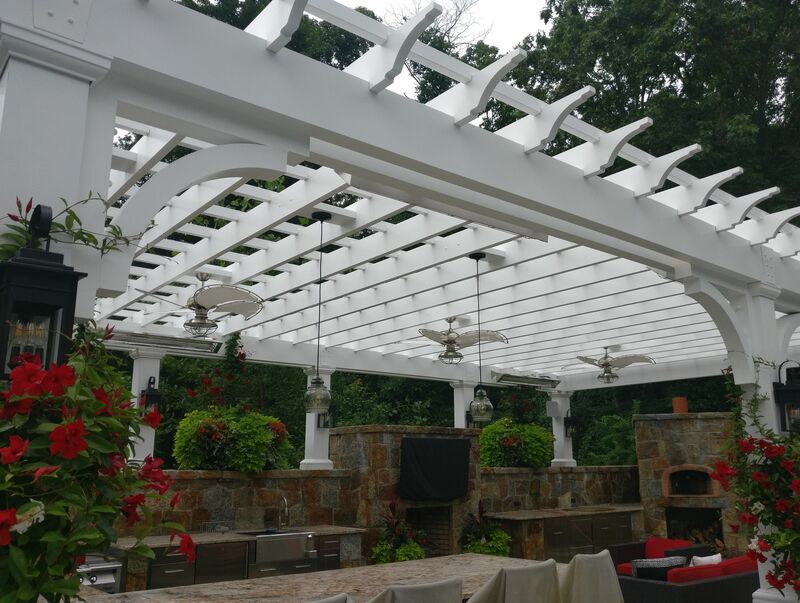 Give us a call today to get started designing your dream pergola. 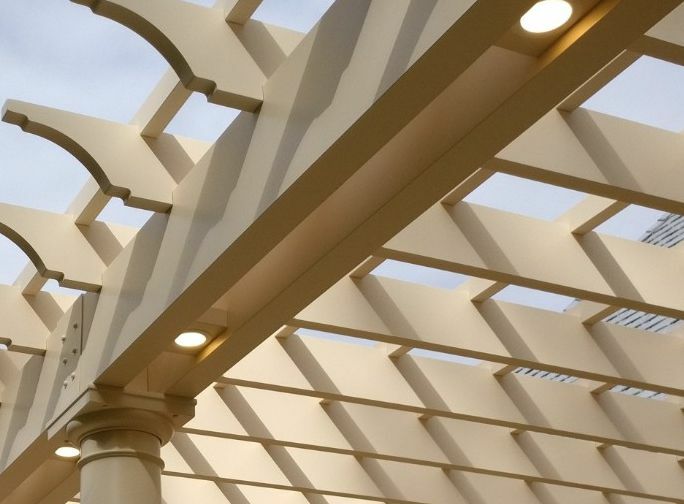 All of our fiberglass rafters and purlins are notched and interlock. This offers a more rigid and aesthetically pleasing structure. We only use the highest quality stainless steel fasteners on all of our products. Stainless steel is guaranteed not to rust and to last a lifetime. Unlike the competition we use only fiberglass bases and not high density foam. 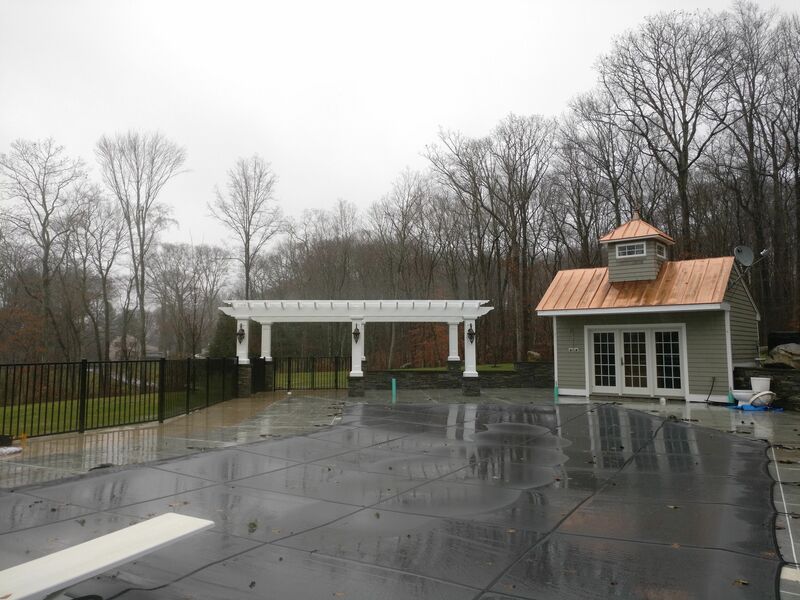 Our fiberglass bases are the same materials as our columns and are not nearly as susceptible to accidental damage. Get a fast & free quote now. 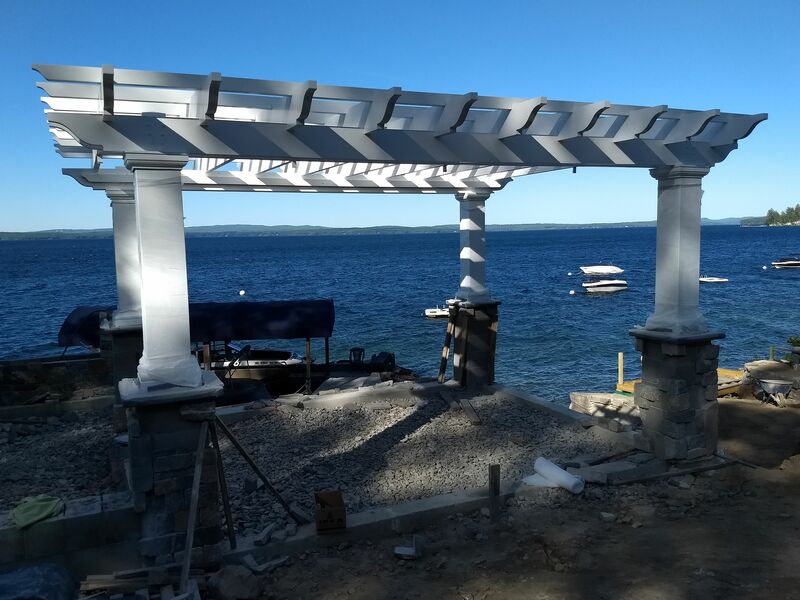 Use our pergola builder to generate a quick quote. We do big. 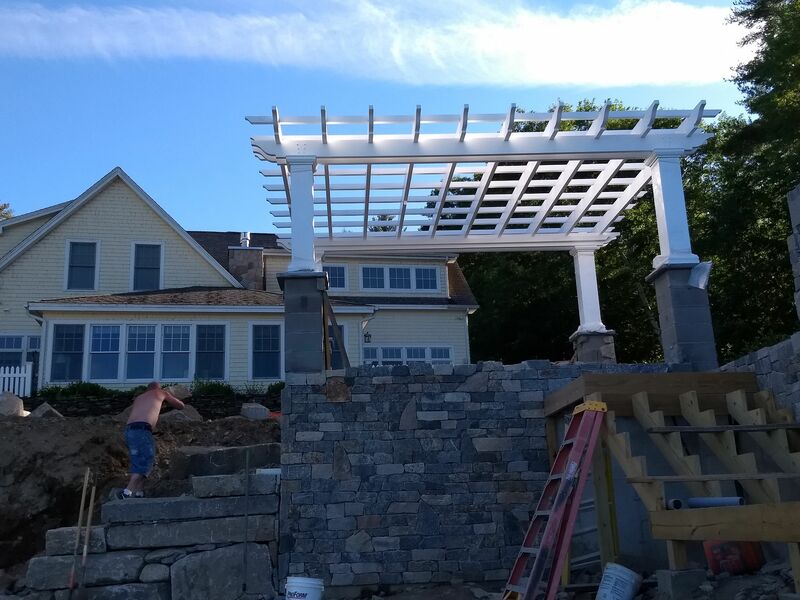 This massive pergola was custom designed and manufactured for a client in South Glastonbury, CT. It features our exclusive 4x12" double beams, custom paint color and custom in-beam downlights. 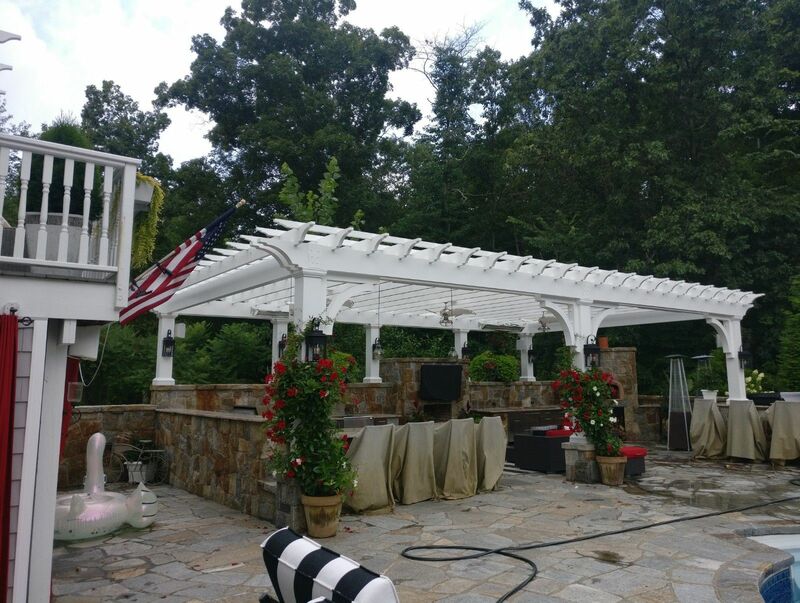 This pergola was the perfect addition to what was a lack luster patio. 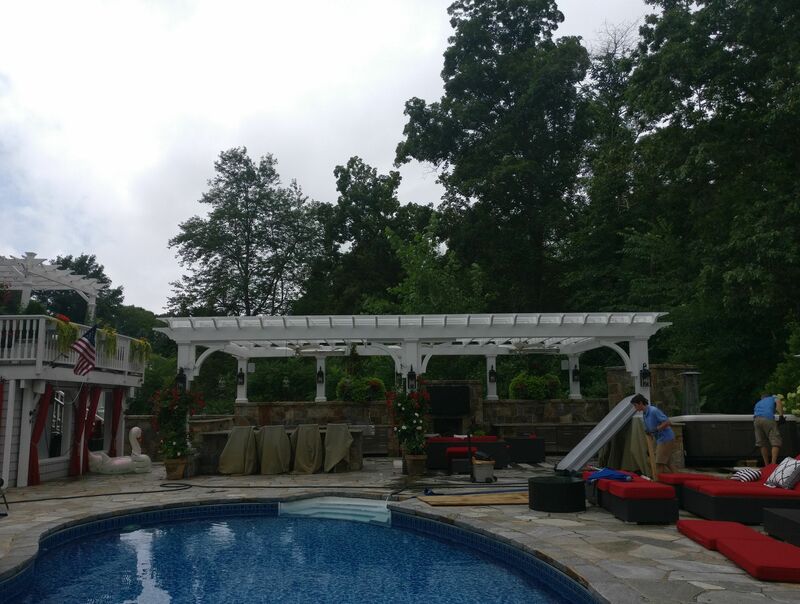 Call us today and speak with our design team to get started on your perfect backyard retreat. We do lifestyle. 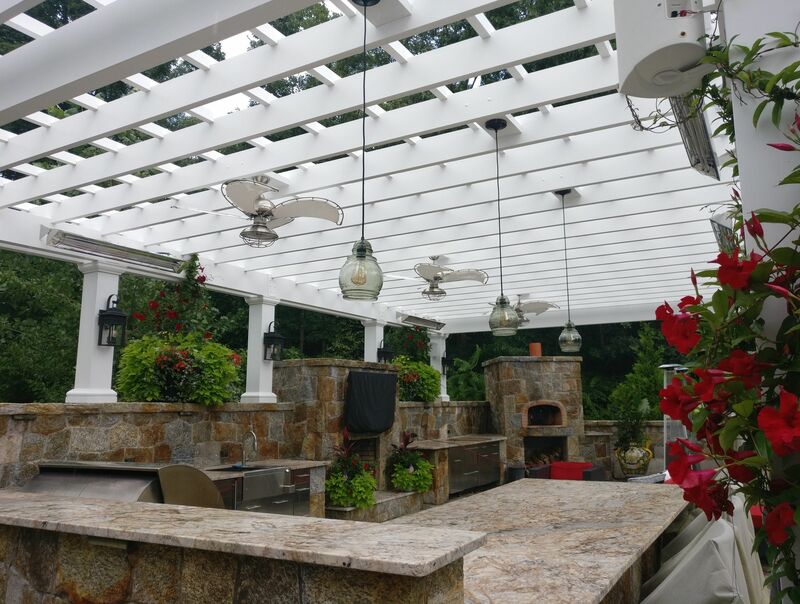 This beautiful pergola was designed and constructed as the covering for an outdoor kitchen. This luxurious space features a bar, grill, sink, flat screen TV and pizza oven. 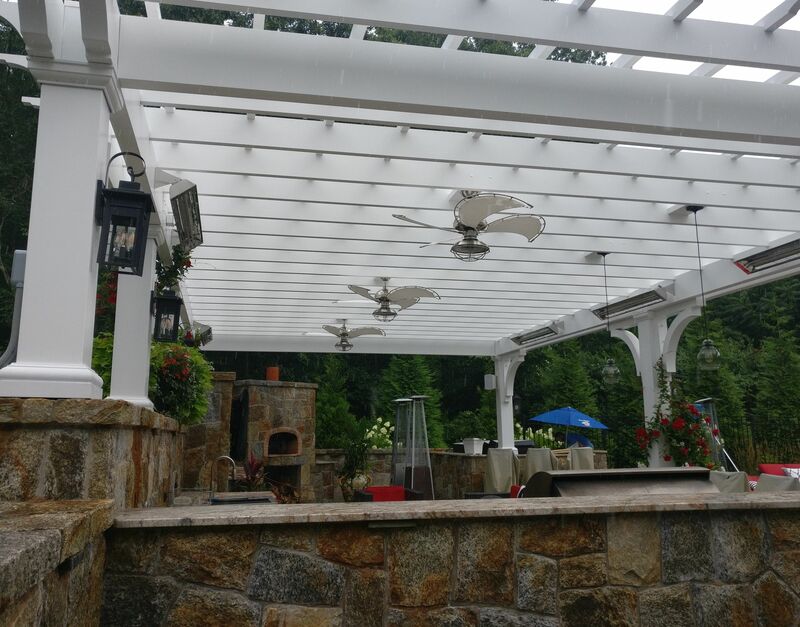 The pergola features three ceiling fans, pendant and sconce lighting along with an outdoor audio system. Four high powered infrared heaters ensure comfortable year round use. 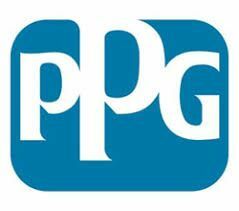 We use the highest and most durable industrial coatings by PPG. 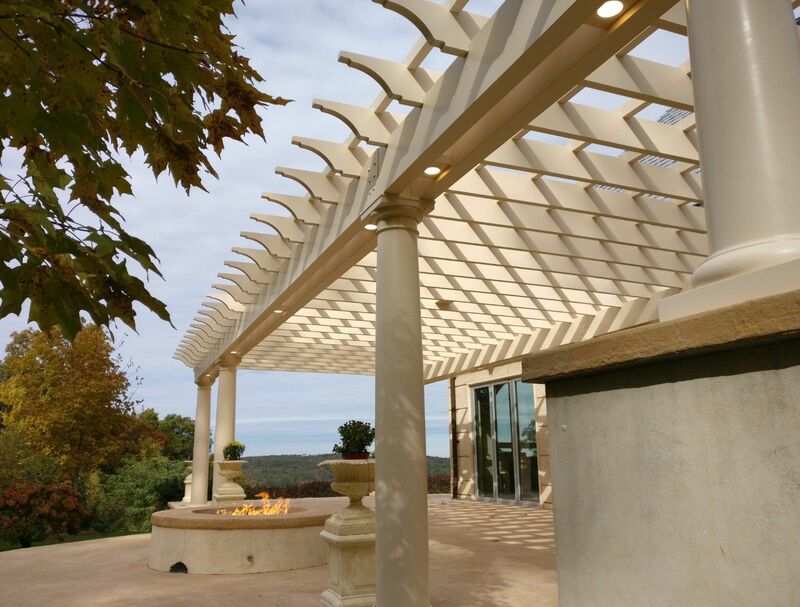 Our fiberglass pergolas are truly ZERO maintenance. 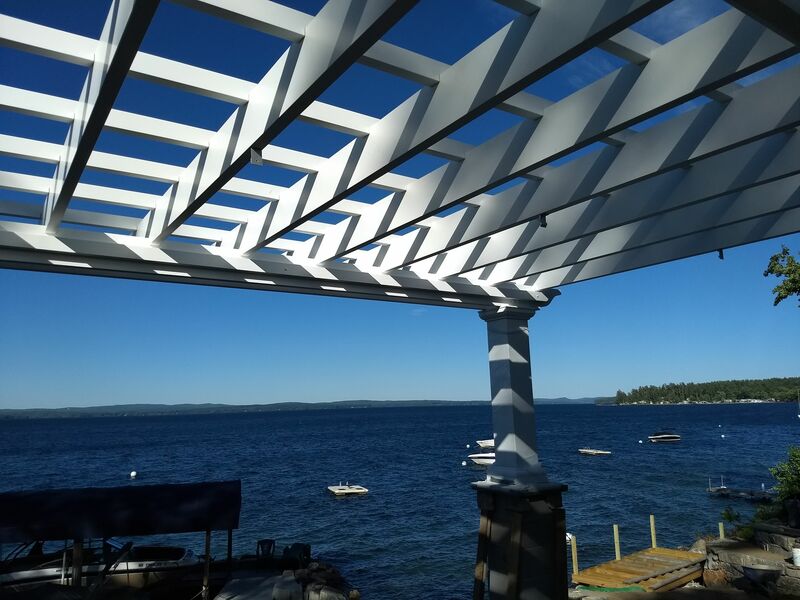 All of our rafters and purlins are notched and designed to interlock. 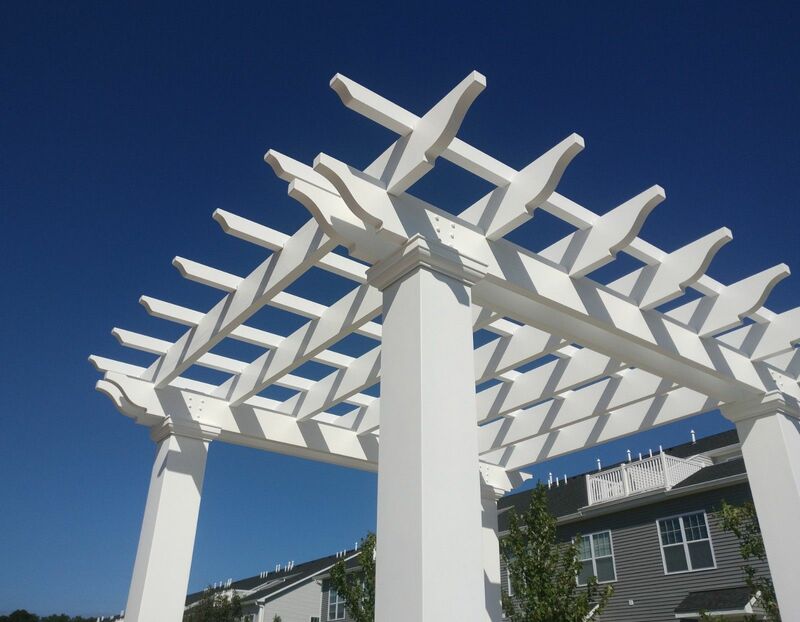 This creates a more stable and structurally sound pergola. We do custom. Our client wanted to create a perfect poolside retreat. 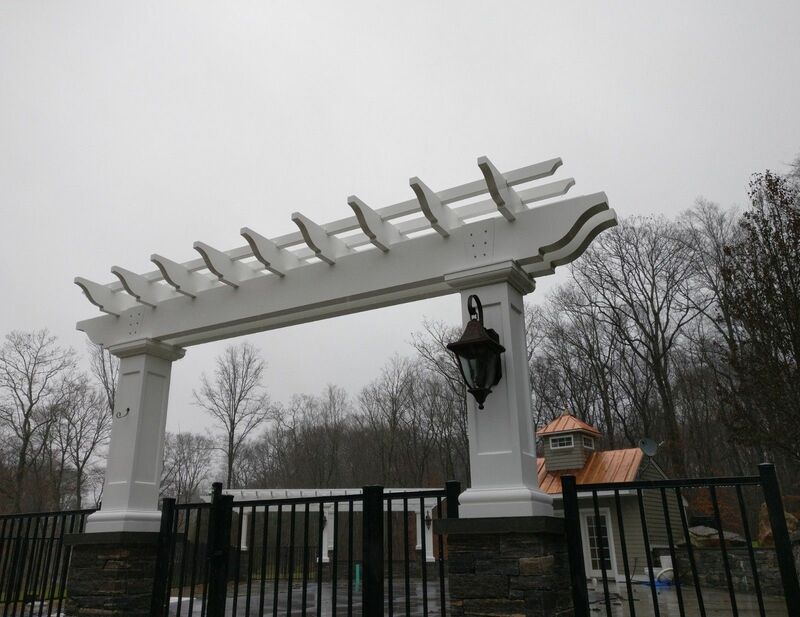 This poolside pergola required custom 12" recessed square columns and massive 4x12" double beams. Custom masonry piers were designed and electrical conduit was run to accommodate the sconce lighting fixtures. 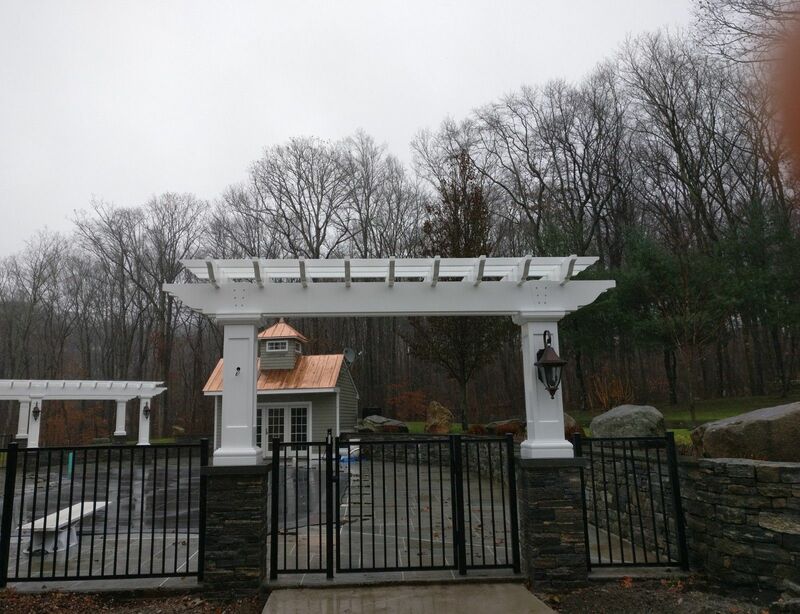 This project also required an entryway colonnade which was designed specifically to address our clients needs. 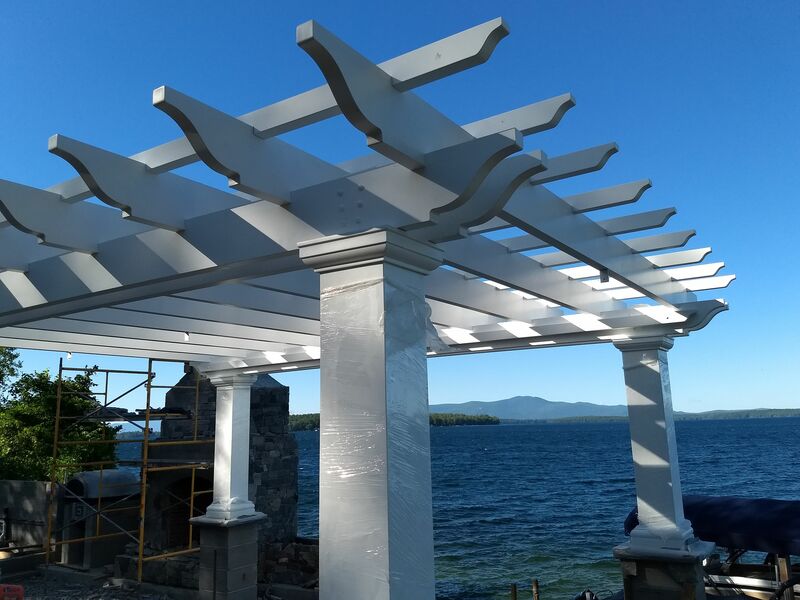 Build your dream pergola today! 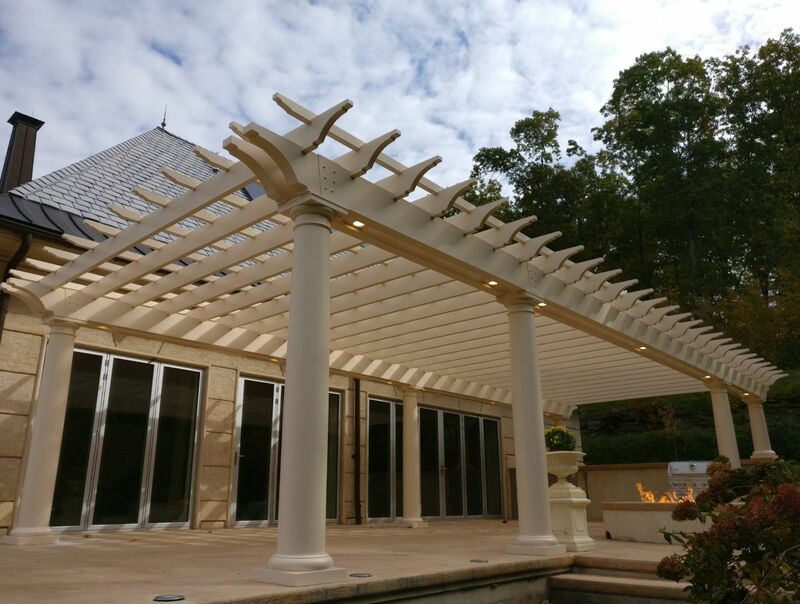 Use our fast & free pergola builder to get your quote today. We do attached. 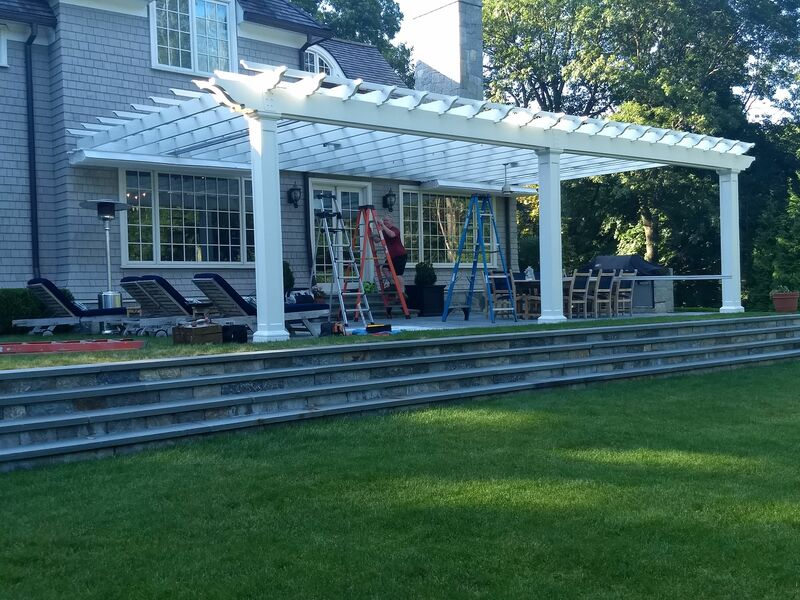 Need a shaded area to entertain? No problem, Baldwin's got you covered. 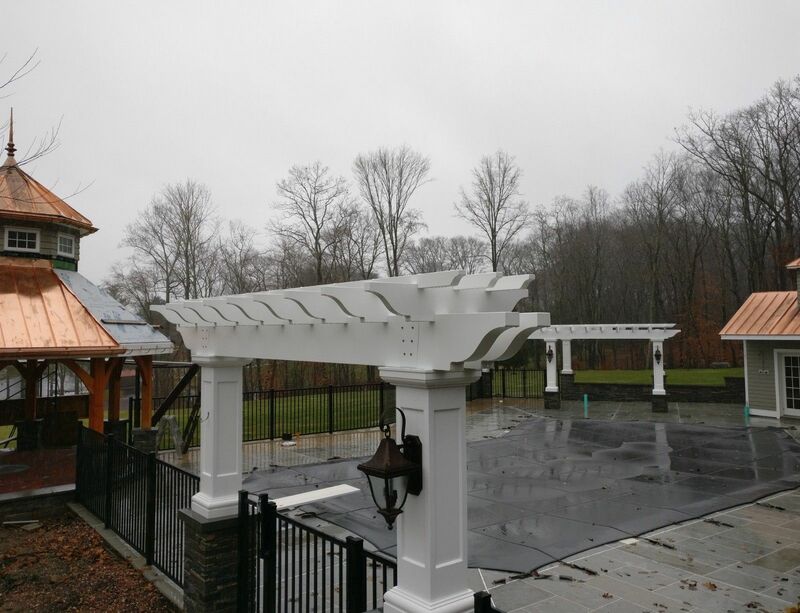 This enormous attached pergola features custom 10"x10' recessed columns along with a custom finish. It nicely rounds out this patio and provides a transitional outdoor space to relax or entertain guests. We do beauty. 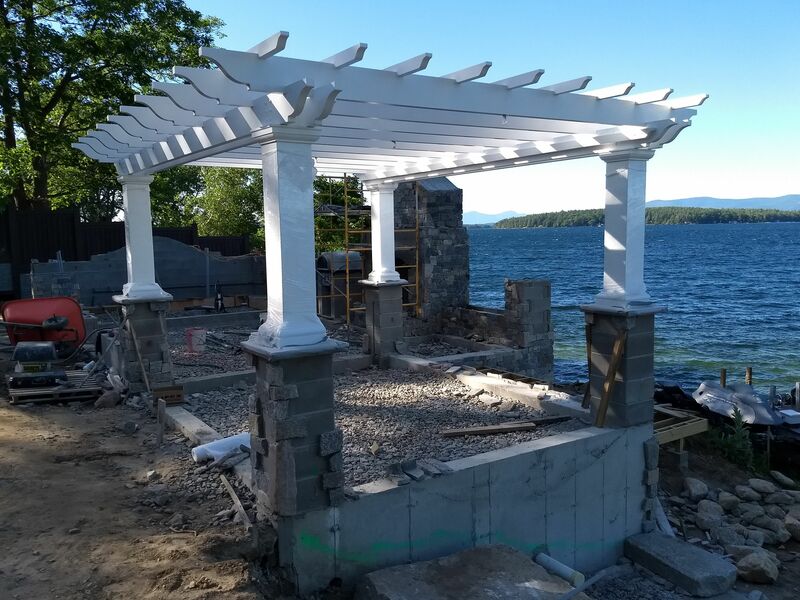 A pergola was just the right addition to this waterfront property! It provides the perfect place to take in the beautiful ocean views and get out of the sun. We worked with our client to get the details exactly right. 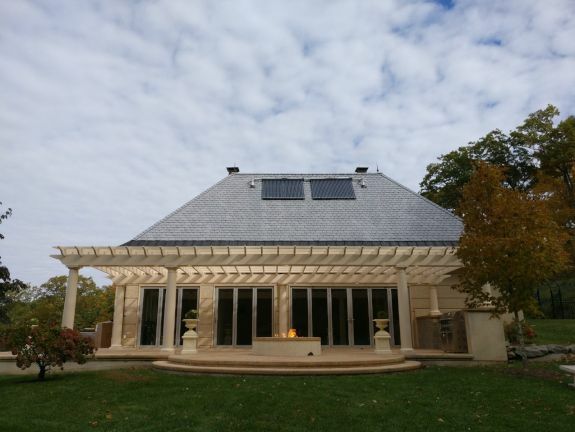 This project was assembled and installed by Baldwin employee installers in a single day. 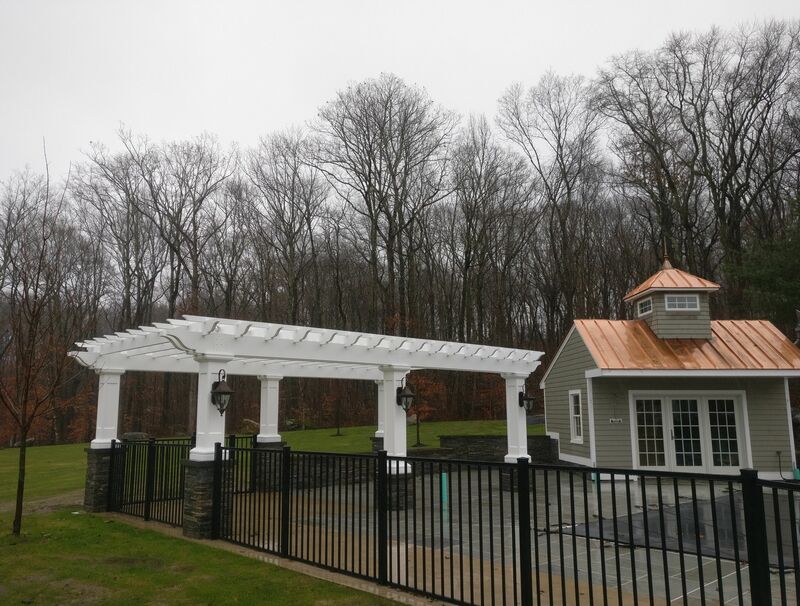 Try our custom fiberglass pergola builder. Greetings! 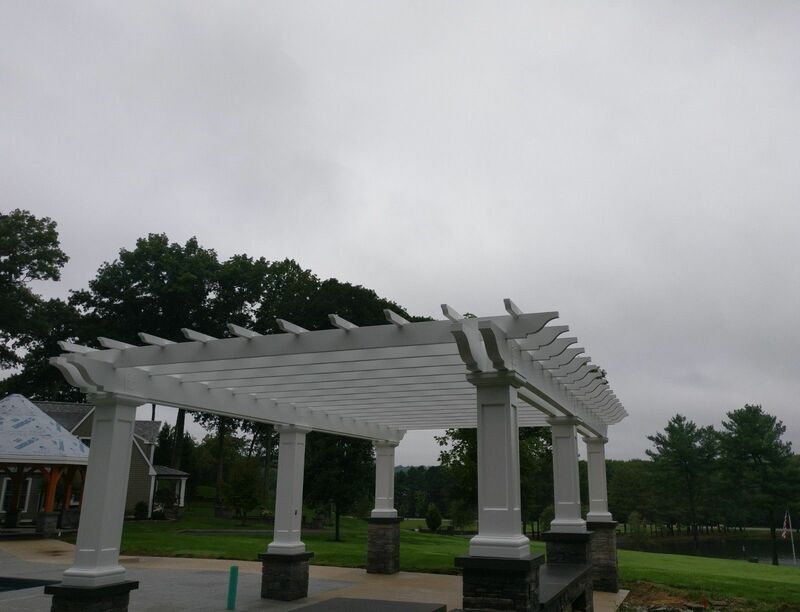 Attached are photos of our Baldwin Pergola which we love. We are very happy. Here are photos showing what it looks like when we hang the colored sheets up for added shade - very festive and inexpensive. Thank you again! Max, I like those screws you use, haven't seen them in Home Depot. 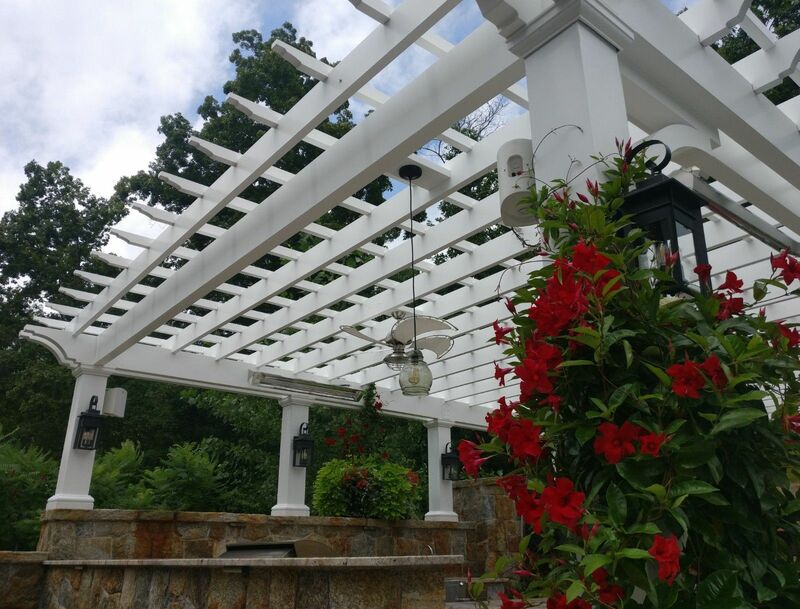 I will upload a picture of the pergola with me resting underneath. It went together really well and things just dropped in - I kept expecting something to go wrong, but it fit together well from start to finish. Thanks for a quality product!